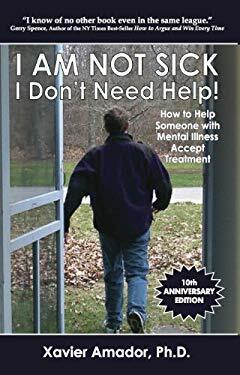 "This book fills a tremendous void..." wrote E. Fuller Torrey, M.D., about the first edition of I Am Not Sick, I Don't Need Help! Ten years later, it still does. Dr. Amador's research on poor insight was inspired by his attempts to help his brother Henry, who developed schizophrenia, accept treatment. Like tens of millions of others diagnosed with schizophrenia and bipolar disorder, Henry did not be lieve he was ill. I Am Not Sick, I Don't Need Help! is not just a reference for mental health practitioners or law enforcement professionals. It is a must-read guide for family members whose loved ones are battling mental illness. Read and learn as have hundreds of thousands of others...to Leap ùListen, Empathize, Agree, and Partnerùand help your patients and loved ones accept the treatment they need. Book jacket.